True wilderness, isolation, silence and pure beauty... NamibRand is simply one of the most incredible, exclusive and wildest places you will probably see and photograph in your lifetime, and indeed one of our favourite places on Earth. This is not just another photo-trip to Namibia. We have visited this country many times already, but on this occasion we will be taking you to the most magical and exclusive places this country has to offer. Expect the trip of a lifetime, exploring areas where we will be totally alone, face to face with some of the most incredible landscapes Africa has to offer. We will explore and photograph some of the most hidden places of the NamibRand reservation, representing virtually all facets of the Namib Desert: expansive sand, gravel plains, endless stretches of grass savannah, majestic mountain ranges and dune belts of deep red sand enhanced by vegetation. The variety of flora and fauna is as fascinating as the colour nuances of the landscape which change continuously as the day progresses. Sunrise and sunset provide light that skims the landscape accentuating the textures of the land and silhouetting the Oryx atop the dunes. This will be a totally exclusive photo trip, where we will have plenty of time to explore, experience and photograph what in our opinion are the very most photogenic, authentic, wild and incredible places of Namibia. This is the perfect trip for those who want to explore Namibia for the first time, or those who have only visited the more touristic places before. 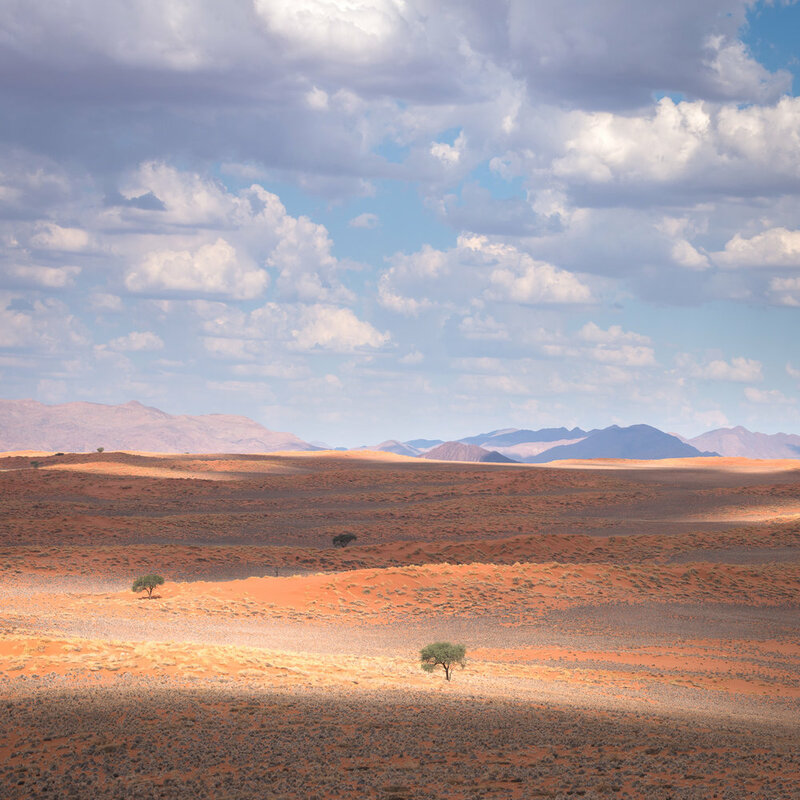 Discover and photograph some of the most magnificent landscapes of the whole of Africa in NamibRand, where sand dunes, grasslands and mountains combine into the quintessential Namibian landscape. Photograph isolated mountains of granite surrounded by the sand, hidden valleys covered with quiver trees and infinite sand dunes under the light of the moon. Inbound transfer to NamibRand by private plane from Windhoek. On our first day, we will leave in the morning and have lunch already at Wolwedans, taking the most of our time. Flying over Namibia will also be an unforgettable experience. One of the most exclusive 5* lodge of Namibia exclusively booked for our group, overlooking the desert in a breathtaking location. Hundreds of thousands of hectares just for us. Fine meals, private guides and a million stars over it all. In order to have proper room for photographic material and have easy access to the incredible views, even when in movement, we will have two separate cars with two private guides for our small group of 7 people.